The US is committed to helping countries find “just and durable solutions” to the Rohingya issue, Ambassador Marcia Bernicat says. The US envoy, who was on a visit to Cox’s Bazar on Monday and Tuesday, met district and local officials, registered as well as undocumented Rohingya refugees, and organisations providing humanitarian assistance in the area. She also visited two USAID-funded projects, according to the US embassy. Bangladesh has been sheltering Myanmar’s Muslim minority Rohingya, who fled sectarian violence at home, for decades. Myanmar has refused to grant them citizenship. The Ambassador appreciated the fact that Bangladesh had hosted hundreds of thousands of Rohingya and what the country had done to help this “vulnerable population”. 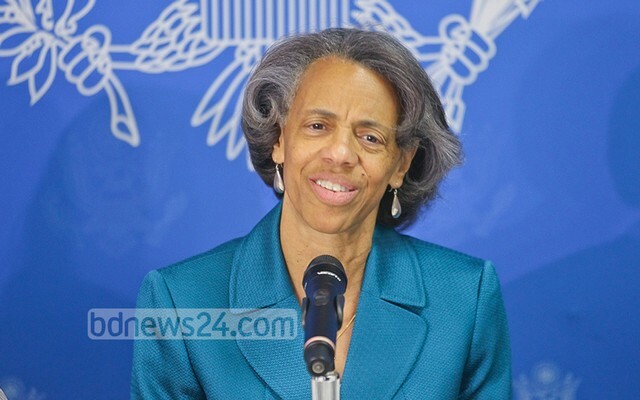 The embassy said she reiterated the US commitment to helping Bangladesh, Burma, and countries across the region “find just and durable solutions for the Rohingya and to providing protection and assistance to Rohingya refugees, asylum seekers and their host communities”. The US government has since 2013 provided over $152 million in life-saving humanitarian assistance to internally displaced persons, refugees, and asylum seekers, including Rohingya, in Myanmar and in the region. This funding supports humanitarian agencies and non-governmental organisations which provide medical care, food, water, shelter, sanitation, and access to services for people with disabilities, the embassy said in a statement.